How come a man from Marangattupally in Kottayam (a small town in Central Kerala) became travel enthusiast? People from villages are the ones who wish to travel more. They are the ones who long for travelling to new places and get to know the world outside their periphery. I have been interested in travel from a very young age onwards. And, my parents have always encouraged me for venturing out from the comforts of my home. My parents never believed that travelling will spoil me or it will in any way, adversely affect me. How many times have you covered the world? If I calculate the total distance travelled, it would be equal to covering the whole world for almost 40 times. For example, I have visited America for about 20 times. I love America because of its vibrant beauty and the cities like Alaska and Caribbean islands mesmerises me. America is double in size when compared to India, thus it has more potential for travellers. Also, they provide visa for 10 years, which is why I make frequent trips to that country. How much of earth have you covered so far? Which are the countries on your bucket list? Almost 120 countries have been covered so far but, I still have 80 more countries pending. I love every country I have been to. Shooting ‘Sancharam’ used to be my first priority. ‘Sancharam’ demanded good knowledge about that country which need to be covered such as its route map, historical importance, major tourist places, its culture etc. It takes 5 episodes to cover one single county and hence proper understanding of its importance was very necessary. You have told once mentioned about the need to create small forums to discuss travel among the youth and also about low budget travelling. Could you please throw more light into this idea? Creating a travel group is a good idea. By saying that I didn’t mean that I can fund the group. I have created a forum to discuss all travel related issues and for arranging travel programmes. Because of my busy schedules, I couldn’t arrange certain programmes which were planned through my forum. And, anybody can travel to any foreign land, or to a place of their choice, if they could save at least Rs 100 daily from your earnings. ‘Sancharam’ has influenced people of all ages. What is its winning formula? The little fans of ‘Sancharam’ those years, are the ones who are travelling across the world. I used to get a lot of E-mails from little fans of ‘Sancharam’ – from Kerala and other parts of the world – discussing about their dreams to travel big when they grow up and secure a job. We have seen many travellers/bikers violate the laws and blow horns while at the fragile wildlife regions. Travel etiquette and Kerala behaviour is a long discussed upon subject from time immemorial. What is your say? We don’t have a travel culture. Most of the people are taking advantage of road signals as to blow horn. Residents in countries such as Peru and Ethiopia which are far less developed than that of Kerala, are following traffic rules systematically. I have been ridiculed in many a countries. Foreigners will frown when they talk about the bad condition of Kerala roads. Travellers who are entering the forest region, should be prepared to adhere to the rules and regulations and learn to respect the nature. As an avid traveller, what advice you want to give to the development of Kerala? Our government is not aware of the requirement of the traveller. For example, a traveller from Europe should be given the Kerala experience, not a pathetic miniature of what Europe is offering him. 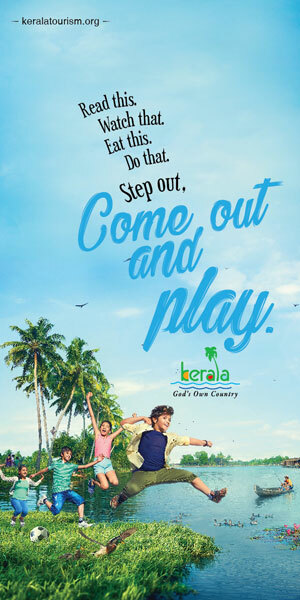 We should be able to give the traveller the essence of Kerala. The government should first try to understand why these foreigners are attracted to Kerala and work towards giving that experience which they wish for. Tourism planning has to include showcasing art, culture, architecture, and the traditional cuisine of Kerala. In other countries, I have seen students in tourism studies are given the task to conduct surveys regarding tourist arrivals. These types of involvement will help them give a better understanding about the travel culture and the details of the foreign tourist arrivals. These are models which we can also follow. ‘Sancharam’ gave me the opportunity to understand the world, and its developments. There’s a lot to learn from those countries who have solved the huge crisis they have faced. Only then we will be able to understand how things can be done and it will also help us our problems in a better way. How should we prepare for travel? Firstly we need to redefine our style of travel. The journey should be for experience, not for enjoyment. The traveller should try to know more about the place, its nature, history, culture, and the life of the people there. It is always good to travel alone as it gives you a better connect with the place and its essence. If you are not comfortable travelling alone, then form small groups. It’s always better to limit the number of people in the group. Travel with less luggage. Always remember that the toothpaste and the brush you carry in your bag are readily available anywhere in the world. We are not going places to carry the weight of our luggage. You can go anywhere in this world and stay for any number of days, with just a bag, provided, you pack it smart. I have been travelling places with just a backpack and a camera bag all this while. The traveller should focus more on inner healing than the materialistic things. How excited are you about your journey up into the Space!? I was thinking about my next journey and suddenly this came into my mind, why not Space? The trials and practices went well but, the dates are yet to be finalised. We’re launching a new travel portal, entirely dedicated to travel and tourism. As an avid traveller, what is your advise? Travelling is a passion for people, so your news portal should act as a platform for sharing their experiences as a tourist. New information should be updated. The news should be trustworthy, accurate and updated regularly. Sucess will follow once you reach a stage where no one would be able to compete or be equal with you.